Seven derelict former colliery houses are being sold for £1 each to help with the retraining and housing of ex-soldiers. 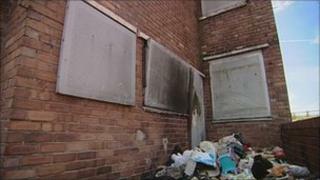 The derelict council homes on Hilmoor Street in Pleasley near Mansfield are being sold by Mansfield District Council to a social enterprise group. Veterans' charity Joint Forces Alliance will help retrain the ex-soldiers in building trades as part of the project. The refurbished terraces will be used to house veterans and homeless people. The homes would be ready for new tenants about a year after the project starts, a Joint Forces Alliance spokesman said. Mansfield District Council's cabinet has backed the proposal to sell the seven properties for just £1 each to the Trees (Training Regeneration Education Employment Sustainability) Group as part its Veteran's Charter. Trees will work together with the Joint Forces Alliance to deliver the project. Jason Rathbone of the Joint Forces Alliance said: "We want to refurbish them and carry out modern apprenticeship... [such as plumbing and electrical work] and basically retrain ex-soldiers and give them real job prospects for the future. He said the group was now waiting for approval from the secretary of state which should take several weeks. "It has taken a year and half in the planning … but now we are waiting for approval from the Secretary of State which should only take two to three weeks," he said. The Independent-led district council has estimated it would have needed to spend about £150,000 to refurbish the seven properties. It has already earmarked £1m for the regeneration of 180 former colliery houses in that part of the town.